The beach of Playa del Arroz, which lies in a small bay towards the eastern end of the stretch of coastline between Águilas at one end and Cabo Cope and Calabardina at the other, is neither the biggest, nor the sandiest, nor the best equipped in the municipality, but for many it is one of the most pleasant. The beach is reached relatively easily from the main RM-D15 road which leads into Calabardina, via a track which heads south from the road just a couple of hundred metres east of the junction with the RM-D14. This track is normally in good condition, and is relatively flat, so there’s little risk of doing any damage to the underside of the car in spite of the fact that access to this beach does require some "off-roading". This track leads the visitor down to a wide expanse of compacted earth where there is ample space to park, and a 60-metre-long sandy beach flanked by rocky headlands. The combination of isolation, easy access and plenty of parking means that this beach is particularly attractive for those with camper vans, who have all the facilities on board to cater for themselves, and generally require more space than the average car in which to manoeuvre. 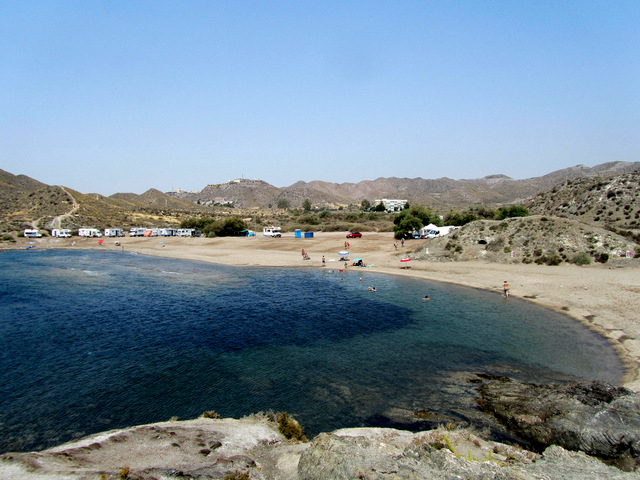 As a result there are often bathers enjoying the sun in this relatively protected cove out of the normal holiday season, but the location is one of the factors which prevent the Playa del Arroz becoming crowded except on occasions in the peak season of July and August. The beach is not entirely sandy – there are some areas of fine pebbles – and services are restricted to rubbish bins, but nonetheless this is an easily accessible and picturesque venue for a few hours in the sun and the sea. The location between two headlands means that water conditions are generally calm, although a small reef in the centre of the beach means that getting into the water is slightly easier at either end. 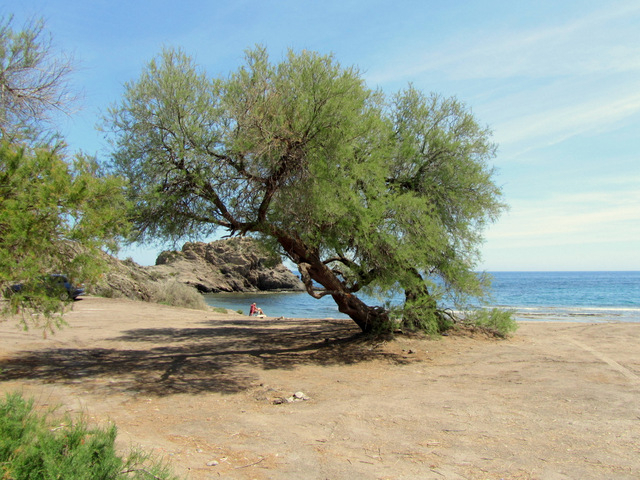 A few trees at the back of the beach provide colour and shade, and if hunger or thirst set in the centre of Calabradina is little more than five minutes away by car. Above all, its picturesque, and those who enjoy wilder-style beaches away from the crowds of urban areas will probably find it a good little beach to know about! 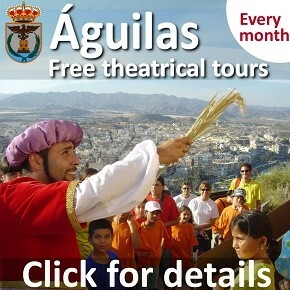 Although there are some rocky coves which don´t quite make the "beach" classification, this is the twentieth beach in the series of 36 Águilas beaches which run along the 28 kilometres of Águilas coast, working from the Almería coastline in the west down to the Lorca municipality and offer both urban and wild beaches.